Joyson Safety Systems (JSS), formerly known as Key Safety Systems (KSS) is a company that develops and manufactures automotive safety systems. The company is a result of the merger between KSS and Takata Corporation after KSS acquired Takata. The safety systems are installed in hundreds of vehicle models. The company headquarters is in Auburn Hills, Michigan, Michigan, in the United States. Globally, the company has 50,000 employees who work in 32 plants and technical centers worldwide. The current JSS Executive Director and President is Guido Durrer. The company is owned by Ningbo Joyson Electronic, described as a « Chinese automotive conglomerate » that acquired Key Safety Systems in 2016 for $920 million. The combined sales of both companies are more than $3 billion. Ningbo Joyson Electronic competed against other large companies in the industry including Autoliv to acquire KSS. 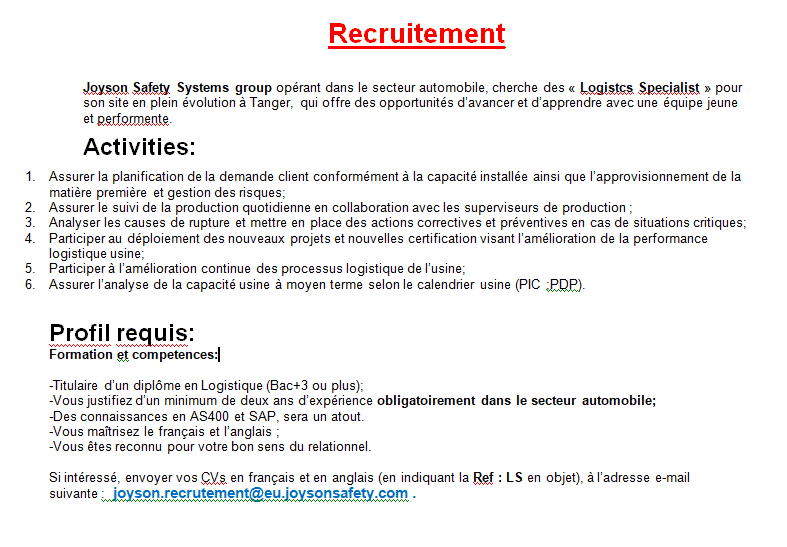 Joyson Safety Systems Maroc est à la recherche de ses deux futurs Specialist Logistics. -Assurer l’analyse de la capacité usine à moyen terme selon le calendrier usine (PIC ;PDP). -Vous avez des connaissances en AS400 et SAP. -Vous êtes reconnu pour votre bon sens relationnel.